BOSTONThe scene could hardly have been more frightening for a Pennsylvania high school student just returning from a tour of Harvard University when the bus she was on slammed into an overpass, injuring dozens of passengers. She did what most kids would do. She called her mother. "She was screaming and crying and saying that the roof was caving in and that she couldn't see anything, and she hit her head and she hurt her arm," said Teresa Merrigan, describing the call from her daughter Alana. Alana and the 41 others on the Calvary Coach bus had just begun the hours-long journey back to the Philadelphia area late Saturday. The driver, Samuel J. Jackson, was trying to navigate Boston's confusing maze of roads and rotaries, famously challenging to out-of-towners. He looked down at his GPS and looked back up and saw the bridge but was too close to avoid hitting it, Ray Talmedge, owner of the Philadelphia-based bus company, told WCAU-TV. Thirty-five people were injured in the crash, Massachusetts state police said. One person was hospitalized with life-threatening injuries and three with serious injuries, the Boston Emergency Medical Services said. Some passengers were trapped for more than an hour as rescue crews worked to free them, Massachusetts state police said. 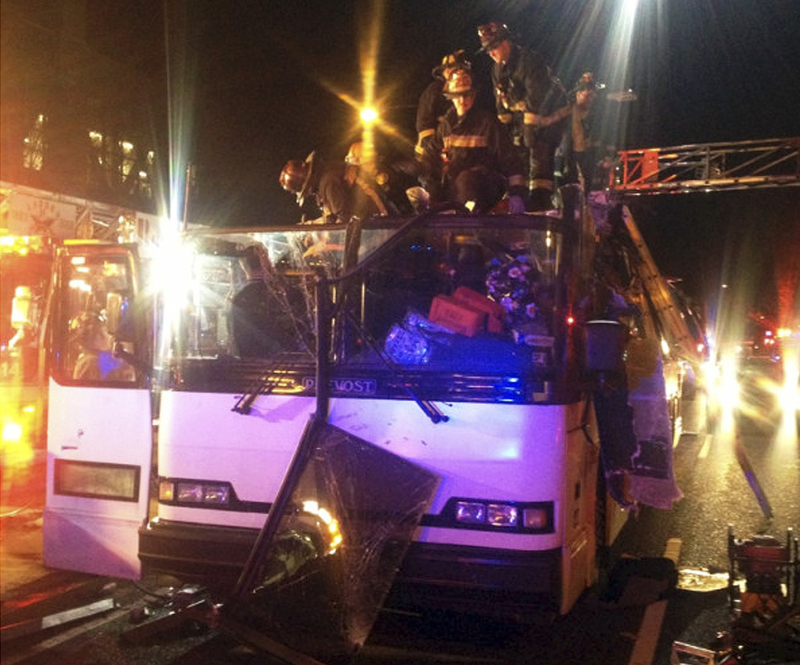 Firefighters stood atop the bus, part of its roof crumpled, and used boards to extract passengers, fire department photos showed. The bus suffered significant damage in the crash. Authorities said the bus did not belong on Soldier's Field Road, a major crosstown street where a 10-foot height limit is in place and oversized vehicles are not allowed. Signs warning of the overpass' height restriction are "all over the place" on the road, Steve MacDonald, a spokesman for the Boston Fire Department, said Sunday. Jackson, who was uninjured, "failed to heed signs" warning of the height limit, state police said, and he will likely be cited for an over-height violation. State police said they'll also investigate how long Jackson was driving on Saturday, and the probe will determine whether he faces more serious charges. Talmedge, who said he didn't know anything about the road restrictions, said Jackson also drives a school bus. No one answered the phone Sunday at a number listed for Jackson in Philadelphia. Neither federal nor Pennsylvania state records show crashes involving Calvary Coach over the past two years or complaints filed against the company. The students were part of a Destined for a Dream Foundation group, Talmedge said. Officials with the Bristol, Pa.-based group, a nonprofit that helps underprivileged young people, would not comment on the crash when reached by phone. The group's Facebook page said the trip to Harvard was to "visit the campus, sit with the office of cultural advancement, followed by a tour of the campus ... followed by Harvard Square (shopping, eating, site seeing...etc...) This should be a fun time for all!" Transit officials sent buses to pick up other passengers and get them out of the frigid temperatures. The accident caused only cosmetic damage to the bridge and road, state police said. The road was reopened Sunday. The crash recalled a similar accident in Syracuse, N.Y., in 2010 when the driver of a double-decker Megabus missed his exit and was using a personal GPS to find the bus station. He passed 13 low-bridge warning signs, some with flashing yellow lights, before hitting an overpass. Four people were killed. The driver was acquitted of homicide charges.